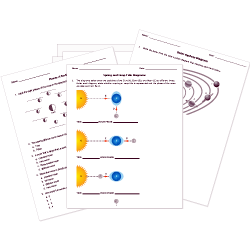 You can create printable tests and worksheets from these Grade 6 Astronomy questions! Select one or more questions using the checkboxes above each question. Then click the add selected questions to a test button before moving to another page. Which is the closest object to Earth? What is the closet planet to Earth? Which is the largest planet in the solar system? Which of the following statements about Earth is true? It is the only planet in the solar system that rotates on an axis. It is the only planet in the solar system with a moon. It is the only planet in the solar system with an atmosphere. It is the only planet in the solar system known to support life. What two gases mostly make up Saturn? All the revolve around the Sun in the same direction. What is the last Moon phase before the new moon? The study of planets, stars, and other objects in space is called . What is located closest to the center of the solar system? Which is the fifth planet away from the Sun in our solar system, or the first outer planet? What is the object that all planets in our solar system orbit? A half moon is also referred to as a . When the people on Earth cannot see a Moon, which phase is the Moon in? Earth's axial tilt affects . Which of the these planets would have the greatest gravitational pull on a nearby object?